Follow the steps below to learn how to download the Audio Description assets in text and/or media file formats. From the My Files page, click on the file you'd like to download the assets for. On the right-hand side under Audio Description, click Download to download the AD Only Media Assets, the Mixed AD + Source Media Assets, or the Text Assets. AD Only Media Assets is the audio description alone and can be downloaded as an MP3, OGG, or WAV. Mixed AD + Source Media Assets is the audio description and the source media, combined into one file and can be downloaded as a MP4, MP3, OGG, or WAV. Text Assets is the audio description in text form and can be downloaded as a WebVTT, TXT, DOC, Merged TXT, Merged DOC, Stamped Doc, and Merged Doc (Stamped). 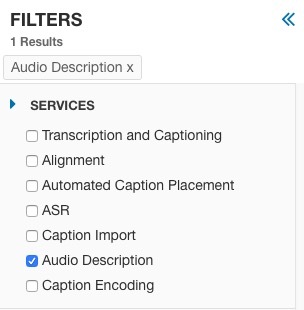 To only view files with Audio Description, from the My Files page, click on Audio Descriptions Complete and a list of completed Audio Descriptions will be displayed.